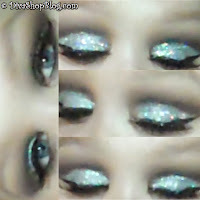 This tutorial is my first attempt at a glittery eye look. There were several times during the process when I was telling myself I should abandon it completely, but I stuck it out. I'm glad I did because, in spite of my lack of experience, it turned out fine. :) For a full list of products used, see below the video.